While the store is tiny and you might just miss it if you don't specifically go looking for it, what caught our attention was the owner's infectious enthusiasm in getting us to try their signature waffle. 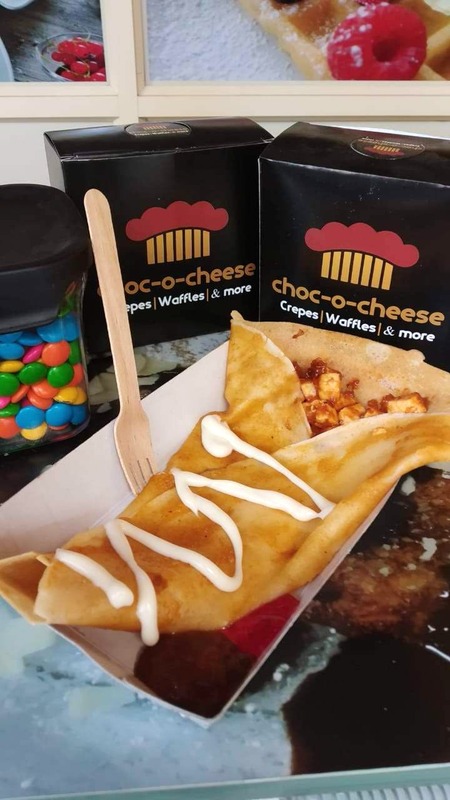 Choc-o- Cheese, as the name suggests, showcases the perfect blend of chocolate and cheese when it comes to waffles and crêpes. The owner, Pralay Chakrabarti, is an ex IIM alumni who quit his corporate job to pursue his passion for the food and hospitality industry. If you're in BTM and looking to try this place, do reach out to him beforehand and he will arrange for a special menu for you and your friends! The store is only two weeks old, but offers a menu with a variety of options. From savoury waffles and crêpes (Fiery Paneer Waffles and Tex Mex Veggie Crêpes) to the classic sweet ones like Nutella Banana (their signature dish - available both as waffle and crêpe), each dish is simply delicious. We especially recommend trying their waffles - the batter is freshly made from scratch, and has a lovely crunch to it. What's more? Each dish costs less than INR 99, so you can binge eat on a budget! Since they're only two weeks old, they aren't yet home delivering, so you'll have to physically go to the store and eat there.